I had the pleasure of sitting down with four of the creatives of MEMORY 5D+ – AN IMMERSIVE MUSICAL ODYSSEY TO A DISTANT PAST at their satellite production offices in Alhambra – from China, its creator Ulan Xuerong, musicians Erkin Abdulla and Lucina Yue; and from California, writer John Hughes. With the wonderful assist of Eileen Cheng who translated for the three Mandarin artists, we were able to get noteworthy insights into the makings of MEMORY 5D+, which will be having its world premiere at the Pasadena Civic Auditorium May 26 and 27. Ulan, the founder and current general manager of her production company China Film HuaTeng Movies & TV Culture Company (CFH) shrewdly sought out contributors familiar with Western tastes in entertainment to introduce the Yin-&-Yang-rooted, classic Mandarin arts to non-Asian audiences. Quite evident in the round table interview, just in first-impression appearances, the cultural mix from traditional Mandarin to blended Chinese and Western to Americanized Western – a perfect example of Yin & Yang in everyday life. Ulan (the total female Yin) carried a lovely air of guarded formality dressed most stylishly from her striking jade jewelry to her shiny silver oxfords. Lucina and Erkin possessed a open ease in their respective smart, fashionable attire. John (the total male Yang), accustomed to working behind the scenes as a senior visual effects artist at Dreamworks Animation, attended in comfortable casual jeans and a Oakley-logo-ed tee. The words ‘harmony’ and ‘love’ (and the ideas behind them) were brought up repeatedly in their descriptions of MEMORY 5D+. The Tao philosophy of Yin & Yang serves as the basis of MEMORY 5D+, with complementary opposites, that when combined, fuse to form a stronger unit of cosmic strengths. Yin’s attributes include qualities of darkness, softness, femininity, being cold and wet; and is associated with water, earth, moon and nighttime. Yang – hardness, masculinity, being hot and dry; and is linked with fire, sky, the sun and daytime. Results are harmonic against the background of universal creation, the opposing forces combining to form the mountains and rivers and other harmonic elements of nature. The title itself MEMORY 5D+ refers to Ulan’s recollections of her beloved Chinese cultural heritage, presented in five dimensions via creative designer Tom E. Marzullo’s multi-dimensional, immersive, state-of-the-art concert production techniques (including high-def digital video and lighting, surround sound, lasers and aromatic sensory technology). Don’t worry, no 3-D glasses needed to be worn. But do expect show-stopping visuals from Tom (whose own impressive resumé includes designing and directing international tours for Justin Bieber, Prince, Luther Vandross and KISS). Ulan trained as a child to become an actress. “Acting is in my blood.”The beginning seeds of MEMORY 5D+ came to Ulan decades before, but she finally started working to realize her vision just three years ago. Ulan wanted to share her centuries-old Chinese tradition via music, dance and visuals. Ulan founded CFH to implement her worldwide delivery of her proud, creative histories. Ulan chose the specific musical instruments in the show with their very distinctive sounds as to how they fit into enhance the MEMORY 5D+ story line. Ulan’s hoping the Pasadena audiences like the show. “It would mean we did it right!” Afterwards, CFH plans to tour MEMORY 5D+ internationally. 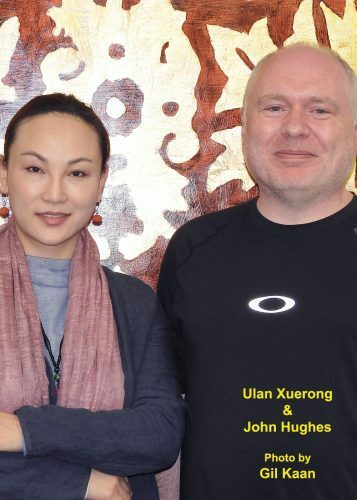 John credits yun-qi (Chinese for ‘luck’) and networking (between friends and friends of friends), that put him together with Ulan. One day, John came home to find his wife (who’s Chinese to his Liverpudlian lineage) chatting with Ulan in their living room. After hearing Ulan’s passionate, very clear description of what was to become MEMORY 5D+, John made the easy choice of signing on to script and shape Ulan’s vision. “Although it’s a show focused on traditional Chinese music, it’s also highly visual in a way that I haven’t really seen before.” John has sharpened his experienced eye for visuals working on big Hollywood productions (including Kung Fu Panda 2, Moana, I Am Legend, Spider-Man 3). Actually, the choice wasn’t that easy as he had to decline work on the Wreck-It Ralph sequel, Ralph Breaks the Internet: Wreck-It Ralph 2. John describes MEMORY 5D+ as immersive. “You’re in the environment embedded in the visual performance of the show, a visual experience that’s larger than the stage, surrounding you, above you, behind you, filling the auditorium.” In the process of adapting this unique Chinese show for Western audiences, John changed as little as possible, instead adding visual touches throughout to clarify the communication of the eastern Taoist philosophy of Yin & Yang for Westerners’ more accessible comprehension. In MEMORY 5D+, Yin and Yang transform into competing characters for the affection of a young maiden. The ‘good guy’ and ‘bad guy’ don’t ‘win’ in the absolute sense. In MEMORY 5D+, love and harmony remain the prominent through-line with no winners or losers. John commented, “My job was quite simple.” He made simple adjustments to the order of the twelve segments of the show. “Lots of the elements were already in place and worked very well.” Despite also being the visual effects artist for Oscar-winning animations Frozen and Big Hero 6, John left all visual effects decisions to Tom and his live concert expertise. Ulan credits John with making her original ideas more dramatic, more striking; making the storyline more consistent in reaching the hearts of the audience. The 43-member cast of MEMORY 5D+ will most skillfully demonstrate examples of Chinese performance arts – Chinese acrobatics, Dolan Muqam (an integration of ethnic group Uygur’s singing, dancing and music), Khoomei (Tuvan throat singing), Shadow Play, Suzhou Pingtan (storytelling and ballad singing), Tibertan folk songs and Urtin Duu (Mongolian Long Tune). As part of this four million dollar production, seventeen of China’s revered musical performers (considered national treasures) will perform their artistry on rare traditional instruments. Test your own musical instrument acumen on how many of these musical devices from Chinese history you have heard of. MEMORY 5D+ will include guqin (Chinese zither), ‘cowboy’ flute, gijak, guzheng, konghou, morin khuur (Mongolioan horsehead fiddle), pipa (Chinese lute), Tuva drum (Shamanic drum), and two chordophones – Topshur and Yekele. Lucina Yue will be playing the Konghou (Chinese harp). Lucina has mastered four different types of harps – the modern Konghou, the old Konhou, the western harp, and the triple harp. A former actress, Lucina’s virtuosity of the contemporary Chinese Konghou has led her to many firsts – performing at the Lincoln Center, at the United Nations headquarters and at New York Fashion Week. Lucinda also has the honor of being the first Konghou performer to appear on Chinese stamps. Guitarist Erkin Abdulla will be performing his original compositions in MEMORY 5D+, combining his Flamenco proficiency with the essence of Uygur’s Dolan Muqam, Turkish folk songs and hints of Brazilian samba and Southern American Blues. Erikin continues striving to make folk music more inclusive, more modern integrating additional international musical elements and ancient Chinese musical forms into western styles. Erkin entertained with a sampling of Turkish folk songs at the press round table. For an insight to where in the Yin & Yang scale you yourself might fall in, come with an open mind to MEMORY 5D+ – AN IMMERSIVE MUSICAL ODYSSEY TO A DISTANT PAST at the Pasadena Auditorium May 26th or 27th and let it be filled with new knowledge of a culture you might have thought you’ve known all about. For an unique exposure to centuries of Chinese culture, concise and abridged, combined with an immersive light and sensory show experience, log onto Memory5D.com and all Ticketmaster outlets for available tickets.